Geotechnical Design Webster: What Are Helical Piles? When you get started on a construction project in Webster, there’s a really high chance that you might not necessarily know what you need to make the possible, engineering-wise. Enter, the geotechnical engineers. If you hire a group of exceptional geotechnical engineers, you can expect them to handle the majority of the geotechnical side of building your construction project that includes the sorts of piles and other ways you’ll need to manipulate the soil to achieve what your blueprints detail. What goes into the process? When you hire a geotechnical engineer, what are you gaining? What are helical piles geo-joist systems and other strange industry level jargon? CMI Structural Solutions hopes to be as transparent as possible with all of our processes, so we’ll happily explain to you everything you’d need to know about hiring a structural company entails and what it gains you. They’re helical piles. They’re created by using a steel shaft with helical flight. In general, they’re used to manipulate unruly soil that might not be laying properly so that you can properly place your structural supports. Helical piles are created to underpin foundations and provide structural support despite the tenaciously stubborn efforts of the dirt particles that won’t lay right beneath your building. Essentially, helical piles act as the invisible force holding your future building, and all of the buildings around you up. These nifty little guys, your helical piles that is, are essentially supporting your literal foundation. 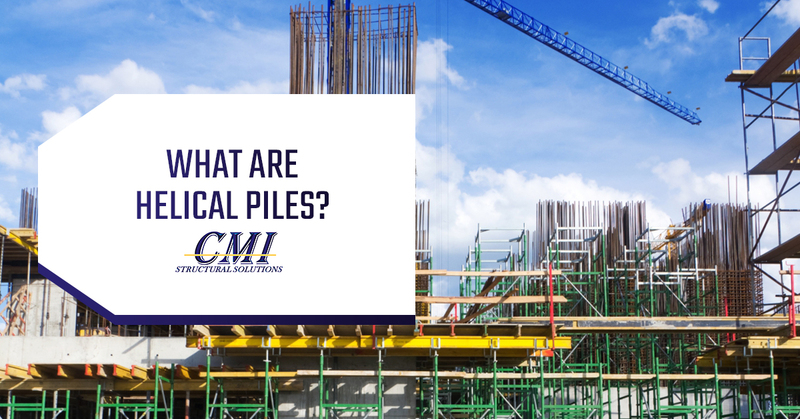 They’re like pile-foundations, and they’re often called screw piles as well as helical anchors. They’re burrowed deep into the ground and are used to disperse the heavy weight of the building that will sit on top of it. Depending on the engineer’s design, usually, a variety of helical piles will be used to create a platform underground which the large structure will eventually rest upon. What exactly does a helical pile consist of, you may ask? They’re shafts of metal that either come in hollow shafts or square, solid shafts. They’re generally made of steel and are available in a variety of different sizes based on gauges and diameters. They all serve a different array of purposes that your geotechnical engineer will detail for you. Generally, a helical pile isn’t complete unless it’s equipped with a helical bearing plate that should be welded onto the shaft of the helical pile itself. It supplies an ample amount of downforce to the soil while it’s being screwed into the earth. On top of the helical pile, they’ll be a shear lug which fits easily to rotary hydraulic attachments so that it can be driven into the ground successfully. You’ll see some helical piles with a lead displacement plate that fits on to the bottom portion of the shaft. It’s meant to push the soil as it’s being screwed into the ground and then leaving plenty of room for concrete to be poured in over the top. How Will The Helical Pile Work? At this point, you may have guessed that they work like screws the get placed into the ground, which is essentially what they are. They’re installed, like screws, by getting twisted into the designated spot in the soil, much like a corkscrew in a cork. While each shaft disappears beneath the surface, an additional extension segment is connected with bolted couplers that are screwed in beside the piles. This ultimately results in a single helical pile that can reach hundreds of feet into the ground. In most cases, the steel pile is actually totally enough to meet the load requirements of the future building but most construction companies and geotechnical engineers opt for the better support and build deep and more robust foundational supports by installing. In these cases, they’ll incorporate concrete with the piles to further enforce the structure. This process easily encapsulates a the pile and produces a column that’ll take any sort of stress from compressive, uplift and lateral moving forces. Need helical piles or other geotechnical engineer services for your next building project in Webster? Reach out to us. We provide revolutionary innovations to the building community that create stronger, more resilient buildings and we want to try out our abilities on yours next. Schedule your consultation today.